In our continued obsession with teaching you about soil, we want to introduce you to the Soil Food Web. Remember when we discussed why soil is so important to plants and our environment? The Soil Food Web is a great way to visually illustrate how plants, animals, bacteria and fungi aid in creating healthy soil that supports our plants. These plants in turn support the entire environment with oxygen, food and habitat. The Soil Food Web describes more than just a single, linear food chain. 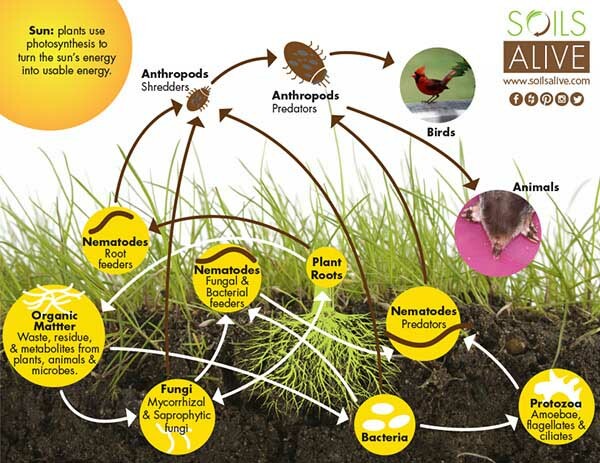 The Soil Food Web illustrates how soil, a complex community of living organisms, interacts with its environment including plants and animals in a variety of ways. The cycle startes with the sun: Plants use photosynthesis to turn the sun’s energy into usable energy for themselves and in turn create fuels that are used by other organisms as food. Plants are called autotrophs,because they produce their own energy. Heterotrophs, such as animals, eat the plants to obtain their energy because they cannot produce their own. There are 3 levels of energy: Producers (plants), primary consumers (herbivores) and secondary consumers (predators). These three levels of energy will cycle through each other several times. At the end of the food chain the decomposers, bacteria and fungi, will eventually break down the dead plant and animal material into nutrients returned to the soil.